The fast movers in today’s environment get into team management roles at very early years of their professional life, while it is a good thing to be a successful person. It is an important thing to remember with the team in hand, especially now as your success is totally dependent on how you manage the team. 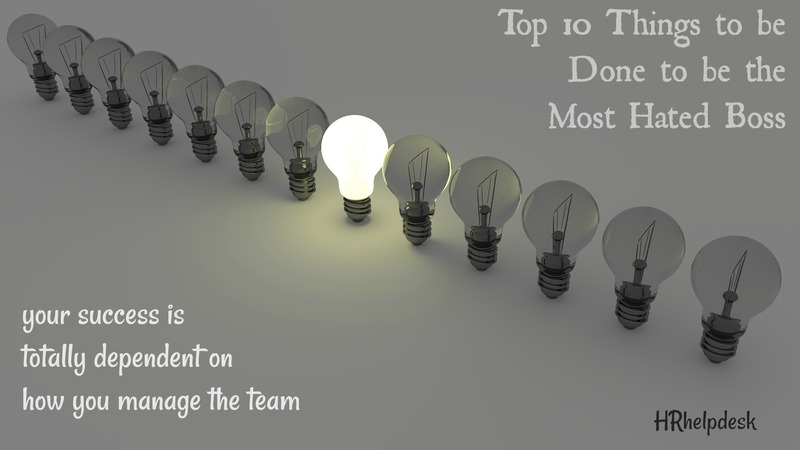 With ambitions that exist in teams today, here are a few top reasons which will ensure that you do not become a successful team manager. While this is a very widely accepted practice, especially as one grows in the hierarchy, it is no longer true that a subordinate needs to go through the grind. Employees in the new-age environment feel they have as much right to enjoy and live life happily as anyone in the top management, probably more as they have more freedom and lesser liabilities both on the personal and professional front. It is assumed that as a supervisor you would take care of the pressures and the work-life balance of your team. If there is work, you would either be there participating in the work thus reaffirming that the work actually is serious enough to demand sacrificing personal time or just let the work not affect them. The visual appearance that you have been working is required by the employees to get the feeling of one status on demand for work. If you must leave and the team has to work late, ensure that you keep sending emails or are online with the team till they are. This is a reminder to the employee of the most talked about and hated work environments from the history of corporate world, with the change in work environment, all employees expect dignity and have a high self-worth. The plush offices, air conditioning and various other benefits, come with an increased self-worth of employees. Raising one’s voice acts as a direct conflict to that, impacting not only for the targeted person but others in the vicinity who start to have doubts on the organizations culture and value system. If you must shout to avoid a deep pain in the stomach, ensure you do so in a closed room with a single person at a time, this keeps others speculating and just adds to the many grapevines which the company already has. With increase in focus on people as an asset, the number of people programmes being run in every organization is increasing. When a conflict arises between prioritizing for time to be spent on work or that programme, you make a statement to your team. If the message communicates you value work tasks more than anything else and are willing to sacrifice things which benefits the team in order to achieve your goals, you are perceived to have a selfish approach to ensure your personal deliveries are met without caring for how others in the team feel. If you must want the team to skip the programme, then you either do a compensatory programme for them or just be in the programme, you have to send the message that I value every individual in the team and am willing to let them make the decision on living life in the workplace the way they want to and not necessarily by sacrificing. All said and done favouritism is actually a real thing and a good thing, it increase the morale, keeps the person motivated and actually helps you in retention. However, it is a risky affair to enter into such a relationship, those who are not in the favourite list, feel left out, feel de-motivated and are always troubled about you as a person. Simply put, you need to either make the entire team as a favourite, by doing multiple things for all of them or not have any of them. Successful leaders have an entire team as favourite. If you must have a favourite, don’t have one in the workplace. As a leader of the team, people are looking at the value you add to them and the pride you are able to instil in the team as a highly successful and a well-knit team. You need to have some unique proposition that is presented to the entire organization by your team. What is the team talking about to others and what do others talk to them about. They get the feel to be awed by others and be able to stack upto the pride of being associated with a boss like you, else, you’re just one of the many people they will crib about. Broadly speaking the same principles we use to sell products. Build a reason for people to be in your team. People need freedom and they despise it when they get into a controlled situation. You as a leader have to build a processes to let others make choices, if you do find your team members looking upto you for decision making even in non-work related matters, you should get a hint. You have controlled the team by fear and are not giving them enough space to experience decision making. Decision making is associated with the feeling of growing up, that’s the biggest thing people want out of life, giving it to them is the biggest way of keeping yourself in the vicinity of being called a good leader. Whatever be the theories about carrot and stick culture, what is definitely sure is that if you are not able to send clear messages to the team members that you do mean business and will not hesitate from using the stick, you would end up being looked as a leader with whom one can take liberties. This leads to direct negative impact on the work deliveries and more importantly on others who are following the rule. They no longer find you a true leader and worthy to be guided by. One of the deliveries a team member looks from a leader is to ensure law and order in the team, something like the work that a chieftain has to do in the tribe, if you fail there, you fail to be a good leader. Remember it is your tribe, so maintain it. The most important thing recognized in today’s work environment is knowledge, if you cannot control your people by knowledge, you can’t control them by anything. It is important to have knowledge and be updated with the most critical things in your work area. There should be very few instances where team members working with you find they are not getting any knowledge value add from you. The position of a team member in the office is largely dependent on your demonstrated power in the workplace, who are your friends and who is in your network. This is purely an “I am a successful person” in the office statement. If you’re not, you’re probably teaching the team to be unsuccessful too, which is going to be resisted by the ever ambitious employees of today’s age. The organization is set up with a framework which is sold to the employee as a hiring tool. If you don’t know what’s happening in the company and what you need to do, chances are you will end up being on the “I care for myself” kind of approach, while it is good to be a person who creates his own rules, as a leader it goes down really on the wrong side. Your team starts believing that you have chosen to be an independent chieftain with your own little tribe caring nothing about the organization, where you call the shots and nothing else matters. So far as things are on their side, it is good, when it turns, you’re the worst boss around, this is contrary to the professionalism which is so much appreciated by people and is one of the key factors for people to join companies.